The Mediterranean world in the Middle Ages was a zone of multiple and overlapping identities. In this zone of competing principalities and elites, various groups identified with a particular doctrinal or ecumenian ideology. However, it was also a zone that was characterized by the interpenetration of religious and ethnic communities. 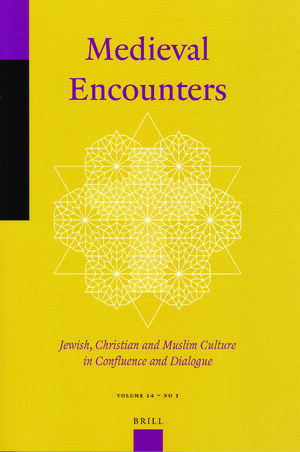 Muslims, Jews, and Christians of various denominations and orientations lived amongst each other, rubbing and jostling shoulders socially, competing and collaborating economically, serving in each others’ administrations and armies, pleading in each others’ courts, passing through each others’ homes and beds, and occasionally killing or otherwise inflicting oppression or violence on each other. Disputation lies at the heart of the Medieval Mediterranean world: a world defined on the formal level by difference and tension between competing religious ideologies and doctrines, philosophical interpretations, political regimes, and spiritual orientations. The Mediterranean was of course home to Christians, Muslims and Jews – adherents each to a universalist religious tradition which, whether directly or by implication, denied the validity of any rival faith. Within each tradition there were also important divisions, whether between the Latin, Byzantine Orthodox and members of the various “eastern” Churches, between Rabbinical Jews and Karaites, and between Sunni, Shi’i and Kharijite Muslims, and the various sub-groups and permutations, whether competing schools of fiqh, or rival claimants for the imamate, that characterized them. Beyond this, there were cleavages that ran across confessional lines: Aristotelians versus Platonists, mystics versus rationalists, and a myriad of other differences of interpretation or understanding of doctrine and perspective. Finally, although the notion of race was only evolving in this period, there were important distinctions characterized by ethnicity and geographic origin, as can be seen in tensions between Arabs and Berbers, Latins, Greeks and “Orientals,” Franks and Muslims, who at times imagined themselves or each other as distinctly generic peoples, and between the members of the various city-states, regions, islands, and towns scattered around the Mediterranean who saw their locale as informing their identity. See the publisher's page here.